12 / MAY OUR HEARTS BE AS THE SEA Extravagant wedding gowns make a statement with breathtaking El Capitan State Beach views. 30 / THE RIGHT SPOT TO TIE THE KNOT From sunny vineyards to oceanfront resorts, flip through our favorite local venue picks! 40 / I BELIEVE IN A PIN CALLED LOVE Pinterest is a bride’s best friend! Find out the secrets to wedding pinning perfection. 42 / FIRST LOOK Beautiful bohemian to edgy glam, find the wedding day look (and the bouquet to match!) that celebrates your style. 56 / HOW SWEET IT IS Indulge in mouthwatering pastries from downtown Andersen’s Danish Bakery to make the best day of your life just a little bit sweeter. 62 / THE WEDDING TALE Pedestals topped with wild bouquets, seven tiers of golden cake, and a candlelit dinner beside a lily pond – be inspired by a gorgeous day of love and luxury at Belmond El Encanto. 88 / LE SABRAGE Wow your wedding guests with a dramatic uncorking of that bubbly. 90 / BE MY GUEST Can’t wait for the wedding but haven’t found the dress? Check out these stunning styles! 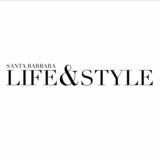 106 / BEAUTIFUL SKIN FOR THE BEAUTIFUL BRIDE Montecito’s Skin Prophecy specialist Dee Dee Serpa-Wickman shares her top 10 recommendations for flawless skin. 108 / LOCALS WE LOVE Clutches, fresh flowers, makeup, and more! Here’s a collection of local wedding experts and items that will make your day magical. Editor It’s our wedding issue and we are welcoming wedding season in style! 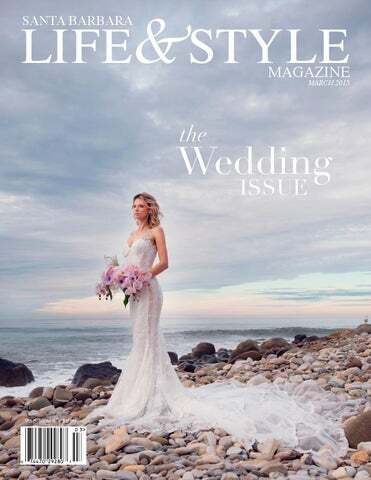 Whether you’re engaged or marking up your calendar with cake filled weekends, these pages are overflowing with breathtaking gowns, sweet local favorites from bakeries to makeup artists, the very best of venues, and bouquets upon bouquets of flowers. and a flawless dinner table in The Wedding Tale. With a whirlwind of wedding fashion, Be My Guest has the looks to keep you on the dance floor at every engagement party, bachelorette weekend, and wedding reception this year! As for the reception... Get a taste of decadent cream filled wedding cake, meringues, and chocolate dipped farmers market strawberries from Andersen’s Danish Bakery in How Sweet It Is. Impress your guests with a dramatic popping of Champagne in our Le Sabrage how-to. To top it all off, we collected a few of our local favorites for your big day – from royal rings and glittery clutches to fantastic florists and the best bakeries, check out Locals We Love for our picks. We’ve also included the ideal wedding day breakfast – light and colorful – in our monthly Dish It Up feature and a step-by-step Get The Look for all the products and secrets of our March cover look! I’m in love with every page of this issue and hope we can inspire your memorable wedding day! SEA Dress, Claire Pettibone. Necklace, Misahara. Dress, Claire Pettibone. Necklace, Misahara. Dress, Galia Lahav. Necklace, Truong & Co. Dress, Galia Lahav. Earrings, Ring & Necklace, Truong & Co. Dress, Claire Pettibone. Earrings & Necklace, Truong & Co. Dress, Claire Pettibone. Ring, Truong & Co. Dress, Claire Pettibone. Earrings, Misahara. Dress, Galia Lahav. Veil, The Dress. Earrings, Ring & Necklace, Truong & Co. Dress, Galia Lahav. Veil, The Dress. Ring & Necklace, Truong & Co. Dress, Galia Lahav. Veil, The Dress. Necklace, Truong & Co.
Say I do! at any of these breathtaking local venues. an Ysidro Ranch is the ideal setting for your intimate wedding celebration! The grounds offer unique romantic cottages, perfect patios, multiple restaurants, and fragrant gardens. The Gardens offer a breathtaking vista nestled in the foothills of the Santa Ynez Mountains, surrounded by charming guest cottages. Convieniently located near the Hacienda, the Hydrangea Cottage offers state-of-the-art amenities housed within a storybook cottage. For the vino lovers, the Wine Cellar features masonry barrel-vaulted ceilings with a stunning glass doorway that leads to a private patio, warmed by a wood-burning fireplace, where guests can mingle under a canopy of loquat trees. The Old Adobe, dating back to 1825, is California historic landmark. With its rustic elegance and charming dĂŠcor, the Old Adobe promises a memorable wedding experience. The Upper Estate Lawn, lined by sycamore trees, features expansive views of the Pacific Ocean and Channel Islands and the 10,000 square foot lawn provides guests with both the natural beauty of Santa Barbara and the serenity and privacy of San Ysidro Ranch. On-site restaurant Plow and Angel provides guests with a cozy atmosphere enhanced with original artwork and stained-glass windows. The Stonehouse features a dining room with creekside views and an ocean view patio with a woodburning fireplace and heated stone flooring providing year-round comfort. n the edge of the Santa Ynez River, in the heart of Santa Barbara wine country, Sunstone Vineyards, Winery and Villa is a beautiful event destination that greets your guests with the delicate fragrance of French lavender and rosemary. The Sunstone Estate has many location options, ranging from intimate courtyards, indoor caves, sweeping lawns, beautiful oak trees, and “in the vineyard.” Reminiscent of wineries in the Provencal French countryside, the courtyard and architecture create the perfect backdrop for your special wedding. As a small family owned and operated winery, they book only a handful of weddings each year. In 2012, the Rice Family opened up it’s once private residence, The Villa, as a venue for weddings and private events. California It Girl Lauren Conrad tied the knot here last fall! Surrounded by sweeping views overlooking the Santa Ynez Mountains and the winery’s 55-acre estate, the Villa is an old world architectural masterpiece. Built from imported limestone from a small village in France, and wood beams and roof tiles reclaimed from a 19th century lavender factory, once owned by Queen Victoria, the Tuscan-inspired Villa boasts 8,500 square feet of luxury living space. The Villa allows for 10 guests to stay overnight as part of their special event at Sunstone, one of the only local winery estates with accommodations. estled between the Pacific Ocean and Santa Ynez Mountains, Bacara Resort & Spa captivates with a timeless allure. It is, quite possibly, one of the most beautiful places on earth. For beach weddings in Santa Barbara, Bacara features several lawns with panoramic ocean views. Perched high above the Pacific Ocean, Bacara offers 78-oceanfront acres for the most romantic weddings. Both the Ocean Lawn and The Bluff boast lush landscaping and sweeping views of the California coastline. An elegant ballroom, offering 23-foot high ceiling with beautiful sculptured details, and over 300 guest rooms, suites, and private retreats, this coastal oasis is made to accommodate big bridal parties and entire guest lists. From an intimate garden setting to a sparkling seaside ceremony, Bacara offers exquisite wedding locations in Santa Barbara and the perfect place the say â&#x20AC;&#x153;I Do.â&#x20AC;? ucked away in a historic Santa Barbara neighborhood on an acre of frangrant English gardens, The Simpson House Inn provides the ideal setting for small to mid-size weddings and elopements. Perfectly suited for groups of up to 100, the boutique hotel offers the perfect combination of historic charm and modern luxury. Wedding parties of 20 or more people include all 15 of the Innâ&#x20AC;&#x2122;s array of unique guestrooms, suites and cottages, allowing couples to surround themselves with friends and family all weekend long. The Simpson House offers couples and their guests a convenient downtown location blended with the privacy and intimacy of a garden setting. Ceremonies take place in the lush gardens, surrounded by the serenity of flowing fountains and the historic 1874 Victorian estate. often ask myself, “What was life like before Pinterest?” It sounds silly, I know, but it is undeniable that I often look to Pinterest to help me organize and structure my life. My Pinterest profile consists of boards titled, “DIY,” “Great Ideas,” and the classic “Wedding,” among a plethora of other topics. A combination of soft pink, tan, and ivory fill my wedding board, giving me a very specific vision of what my special day will look like when that time finally comes (have I mentioned I’m not even engaged yet?) Although wedding bells aren’t ringing any time soon for me, this doesn’t mean that I cannot indulge in the wedding bliss of the bride-to-be or offer some of my most helpful tips to help get the marital ball rolling. Looking for a dress can be so daunting, but if you have an idea of the style dress you want, you’re already that much closer to finding the one. Simply enter the style of dress you’re looking for, add details, and voila! a slew of images will pop up to guide you in the right direction. I can’t even count how many talented undiscovered or up-and-coming designers I have found by searching through Pinterest. Need some wedding picture inspiration? Pinterest offers tons of tips like, questions to ask your photographer, sweet and original poses for the bride and groom, and even engagement photo tips. Also, do a little research and follow photographers whose work you love. You never know if reaching out via Pinterest can land you the photographer of your dreams! The only things more important than a wedding dress during the wedding planning process are the location and theme. Pinterest helps expand your vision for what a beautiful wedding can truly be. From ballrooms to barns, Pinterest highlights some of the most beautiful receptions in every setting. It’s much easer to show your wedding planner what you want instead of telling her, so use this visual search engine to your advantage. Remember that your bridesmaids are a big part of your wedding. They will be walking down the aisle before you, standing by your side at the altar, and in your wedding photos, which last a lifetime. Therefore, it is crucial that you choose the right dress color and length, as well as hairstyles that will complement each girl individually, while also making you standout. Create a secret board, which can only be seen by those in your bridal shower, to pin your favorite looks and hairstyles. This way your ideas remain yours without fear of any copycat brides! And to make sure that you haven’t forgotten any details, Pinterest helps with first-dance playlists, wedding planning schedules, tips on how to dress shop, to even cake serving guidelines! Dress, White Chocolate by Scott Corridan, The White Peacock Bridal. Necklace & Bracelet, Coast 2 Coast Collection. Bouquet, Camillia Floral Design. Dress, White Chocolate by Scott Corridan, The White Peacock Bridal. Necklace & Bracelet, Coast 2 Coast Collection. Shoes, Jimmy Choo, Saks Fifth Avenue. Dress, White Chocolate by Scott Corridan, The White Peacock Bridal. Bracelet, Coast 2 Coast Collection. Bouquet, Camillia Floral Design. Dress, J. Crew. Coat, White Chocolate by Scott Corridan, The White Peacock Bridal. Necklace, Earrings & Bracelet, Coast 2 Coast Collection. Bouquet, Camillia Floral Design. Dress, J. Crew, The White Peacock Bridal. Necklace, Earrings & Bracelet, Coast 2 Coast Collection. Shoes, Jimmy Choo, Saks Fifth Avenue. Necklace & Bracelet, Coast 2 Coast Collection. Shoes, Jimmy Choo, Saks Fifth Avenue. Dress, J. Crew. Coat, White Chocolate by Scott Corridan, The White Peacock Bridal. Necklace, Earrings & Bracelet, Coast 2 Coast Collection. Dress, White Chocolate by Scott Corridan, The White Peacock Bridal. Necklace & Earrings, Coast 2 Coast Collection. Bouquet, Mercyâ&#x20AC;&#x2122;s Flowers. Dress, White Chocolate by Scott Corridan, The White Peacock Bridal. Necklace & Earrings, Coast 2 Coast Collection. Shoes, Jimmy Choo, Saks Fifth Avenue. Belt, The White Peacock Bridal. Bracelet & Earrings, Coast 2 Coast Collection. Bouquet, Camillia Floral Design. Dress, vintage, The White Peacock Bridal. Necklace & Bracelet, Coast 2 Coast Collection. Earrings, Coast 2 Coast Collection. Bouquet, Mercy’s Flowers. On her: Wedding Gown, Wtoo by Watters. Hair piece, The Dress. On him: Suit, Zara. Berry Tartes Fresh seasonal berries, raspberry jam, Bavarian cream, and vanilla cookie crust dipped in chocolate, all topped with an apricot reduction. Chocolate Dipped Farmers Market Strawberries Dutch chocolate dipped strawberries adorned twith white chocolate. White Roses Cakes Vanilla cake layered with raspberry spread and Bavarian cream, topped with roses and white chocolate decortifs. Meringues Meringues dipped in joyous colored chocolate. Marzipan Danish Layer Cake (Swedish Princess Cake) Scrumptions sponge cake layered with organic whipped cream and fresh raspberry spread, covered in pink marzipan and topped with fresh raspberries. Chocolate Madeira Cakes Chocolate cake layered with chocolate ganache and Madeira chocolate mousse, garnished with whipped cream and chocolate shavings. Marzipan cake, raspberry spread and buttercream atop shortbread, covered in pink ganache. Vanilla cookie crust filled with buttercream and Meyer lemon mousse, topped with lemon ganache. SAVE 3O% OFF NEWSSTAND PRICES! A historical European technique for opening a Champagne bottle with a saber or knife, the ceremonial tradition of Sabrage dates back to Napoleonic times. Follow these instructions to wow your bride and wedding guests alike! separates the collar from the neck of the bottle. The cork and collar will remain together after they have been broken. The 100 psi in the bottle will take all glass shards out of the bottle. Once the bottle has calmed pour for your lady and yourself. Some bottles don’t sabrage as well as others. For example, Chandon can be a disaster, the glass is too fine. The Roederer Estate brands don’t sabrage well either. Avoid brands with plastic corks. Korbel and all brands of French Champagne work very well due to the thicker glass. Surprise your bride by instructing her on how to sabrage and let her wow the crowd. Dress, BCBGMAXAZRIA, Saks Fifth Avenue. Gold Bracelet, Aesa. Infinity Bracelet & Black Diamond Ring, Adornia, Whistle Club. Dress, BCBGMAXAZRIA, Saks Fifth Avenue. Infinity Bracelet & Black Diamond Rings, Adornia, Whistle Club. Dress, Adian Mattox. Shoes, Stuart Weitzman, Saks Fifth Avenue. Infinity Bracelet & Black Diamond Ring, Adornia, Whistle Club. Dress, Adian Mattox, Saks Fifth Avenue. Earrings, Infinity Bracelet & Black Diamond Ring, Adornia, Whistle Club. Bouquet, Mercyâ&#x20AC;&#x2122;s Flowers. Dress, Alice + Olivia, Saks Fifth Avenue. Necklace, Stylistâ&#x20AC;&#x2122;s Own. Bracelet, Adornia, Whistle Club. Dress, Alice + Olivia, Saks Fifth Avenue. Necklace, Stylist’s Own. Bracelet, Adornia, Whistle Club. Bouquet, Mercy’s Flowers. Beautiful Skin for the Beautiful Bride A start to beautiful skin. Dee Dee Serpa-Wickman of Skin Prophecy Clinic & Skin Care Institute shares her top 10 recommendations for flawless, healthy skin on your wedding day - and everyday of your happily ever after! Monthly or bi-weekly clinical facial treatments are ideal for controlling any skin condition and keeping up with your skin maintenance! A bi-weekly treatment plan is an excellent option if youâ&#x20AC;&#x2122;re looking to bring acne or pigmentation issues under control while monthly treatment plans provide regular check-ins and maintenance to ensure you are on top of your home care regime. It is important to choose an experienced clinical esthetician or physician assistant specializing in skin who knows how treat ALL types of skin types and heal challenged skin! Sleep is a key to health and healing! To give your body and mind time to restore and renew its natural radiance and shed toxins, sleep no less that 7-8 hours every night on a consistent basis. The best nutritional benefits come from natural ingredients! Eat a diet full of vitamins, minerals, enzymes, and antioxidants--all of these contribute to wellbeing. If it comes from a plant, eat it – if it is made in a plant, don’t eat it. Water carries toxins out of the body and the less toxic build-up that is in your system, the clearer your skin. Divide your body weight in half for a good estimate of how many ounces of water you should drink each day. Drink an extra glass for every cup of coffee, black tea, or alcoholic beverage! Stay on top of your program! We love what we do and want you to look and feel radiant on your big day. If you’re not using one already, meet your new best friend. This cleanses the skin 6x more, improves circulation, and makes the skin “bioavailable” for better product absorption. Choose result-oriented products for your unique skin type. With so much Santa Barbara sunshine, always use a non-comedogenic (won’t block pores or cause blackheads) full-spectrum physical sunblock, versus a chemical sunblock, with at least 15-30 SPF. If you are in the sun all day, reapply that sunscreen every 2 hours! Cardio is excellent for the lymphatic system to release toxins. It’s also important to shower right away to wash away bacteria and prevent any congestion or breakouts. Remember your skin is the largest organ of your body! Take care of it and take care of yourself. No blushing bride wants to be without the necessary touchups on her big day. Small clutches are the perfect fit for toiletries like makeup blotting papers, lip gloss, and face powder, not to mention a tissue or two for those post-ceremonial tears. These clutches offer a secure holding place while adding a dash of sparkle to stunning wedding attire. DISH IT UP A simple monthly recipe, to try at home, from our team to you. Mimosa ...because itâ&#x20AC;&#x2122;s your wedding day!